The course offers 18 hours of sailing, mostly on the water. You will sail on stable and well-maintained keel-boats ranging from 22 to 27 feet in length. After successfully completing our course you may want to crew with us during Wednesday night races; attend a club meeting to understand more about the activities and benefits; or buy a boat and secure a dock at our marina. Whatever your goal, you will find that the learning and friendships do not stop with the completion of the class. We invite you, will help you, and welcome you to join us in our fun! 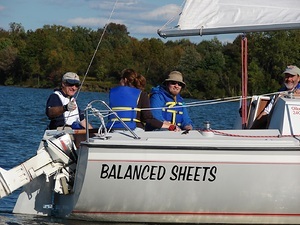 The curriculum for each Shore School Class, and for each On-the-Water Course being offered, is identical. It follows the US Sailing course format and recommendations for Basic Keelboat Instruction.